Symptom: After moving machine, powering up causes all solenoids/coils to energize. Loud buzzing from speaker. Smoke visible. 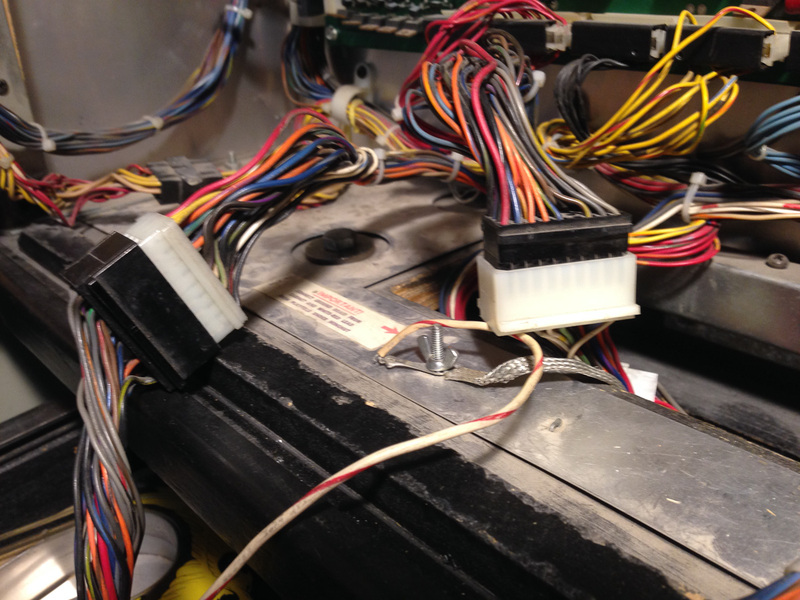 The owner or movers had disconnected the backbox cables in order to remove the backbox from the machine to make moving easier. Unfortunately, the connectors were not plugged back together properly after the move. Backbox connectors not reconnected to proper connectors. White is going to black, and black is going to white. The is the second repair job I’ve had where this situation had occurred, so I thought I would write about it. Unfortunately, Williams didn’t key the connectors in such a way to prevent the wrong connectors being plugged together. They did make them different colors, but it happens anyway. Black goes to black and white goes to white. Swapping the connectors can cause significant problems, burning out chips and the sound system. Since this is the second Black Knight I’ve seen with this problem, I’ll refer to it as machine “B” and the one I worked on last year as machine “A”. Below is summary of parts I had to replace to get each machine working. Speaker in the bottom of the cabinet. IC1 on sound board (TDA2002V). This is the amplifier. Q2 on sound board (2N4401). LM323K voltage regulator on the power supply board. (Some Black Knights might have a different power board that uses a 2N6057 transistor with a separate regulator circuit. The parts are not interchangeable). IC7 on MPU board (7404). IC12 on MPU board (7408). IC11 on Driver board (6820/6821). IC17 on Driver board (7406).